A draw was held by Nova Scotia immigration officials under the Entrepreneur stream on November 15th, 2017. 24 candidates have issued the Invitations to Apply for Nova Scotia immigration, and the lowest-ranked candidate had a score of 91 points. In The previous draw, held on October 10th2017, 12 Invitations to Apply issued, and the lowest-ranked candidate had a score of 97. The highest numbers of invitations in a monthly draw were 36, and the lowest score was 90. During the year 2017 the scores ranged between 90 and 100, and for 2016 they were between 97 and 122. The Entrepreneur stream of Nova Scotia aims to draw candidates who have the experience in business ownership and senior management. They are required to live in Nova Scotia, and start business afresh or buy an existing business, and participate in the daily control of that company actively. Under it, candidates get initially issued, a temporary work permit before applying for permanent residence after they have operated the business for one year. It has an Expression of Interest format, where candidates present in the pool are invited to apply. Should have an age of 21 or above. Expressing a desire to live permanently in Nova Scotia and owning a business actively, and managing it in Nova Scotia. Need to have a net worth of $600,000. Investing $150,000 in establishing/purchasing a business in Nova Scotia. Having three years of experience of actively managing/owning a business with 33 percent ownership) or need to have five years of experience as a Senior Business Manager. Having a Score of 5 on the CLB and ability to speak, listen, read and write in English/French. On November 15th, 2017, the province conducted its fifth draw for International Graduate Entrepreneur stream. Two candidates were issued with Invitations to Apply, and the lowest-ranked candidate scored 62 points. So far seven candidates have been invited to apply. International Graduate Entrepreneur Stream: Historical Draws The International Graduate Entrepreneur stream has similar features like the Entrepreneur stream and targets recent graduates educated from a Community College or university based in Nova Scotia. They are required to start/purchase a business in Nova Scotia and run it for one year after holding a Post-Graduation Permit to Work. Candidates receive PR nomination if they plan to settle in the province. The stream functions in the Expression of Interest format like the Entrepreneur stream. 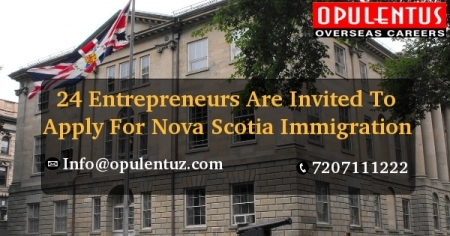 The desire to live in Nova Scotia permanently at the time of owning and managing a business in Nova Scotia actively. Having one year of experience continuously and being actively managing and owning current Nova Scotia business with an ownership of 100 percent. Having completed a degree/diploma in two academic years on a full-time basis, and doing an in-person study in a university or Community College located in Nova Scotia. Having a Score of 7 on the CLB and ability to speak, listen, read and write in English/French.